Activists from the Humane Society collected signatures for a November 2016 ballot initiative. Hunters in Colorado were baiting black bears with jelly doughnuts and food scraps, then shooting the animals when they ambled up to eat. They used dogs to chase bears up trees for an easier shot. And killed bears in spring, leaving orphaned cubs. Many Coloradans opposed these practices as unsportsmanlike, but pressing state and legislative officials to act brought no change. So opponents tried bringing the issue directly to voters — and the ballot measure sailed to a lopsided victory. For Wayne Pacelle, who was involved in that 1992 effort and now leads the Humane Society of the United States, it was a clarifying moment and helped inspire a slew of successful animal welfare ballot questions of all sorts across the country. Now, the Humane Society is poised to take its most ambitious referendum yet to Massachusetts. Voters in November 2016 are likely to decide a controversial ballot initiative that would ban the production and sale in the state of eggs from hens and meat from pigs and calves kept in tight enclosures. While voters in other states have outlawed certain farming practices, no ballot question has attempted to ban the sale of meat and eggs from animals raised in a certain way, according to specialists in the field. The effort is set to bring a raging debate to a state with relatively little egg and meat production that’s not known for divisive battles over agricultural issues. And it could pose the biggest test yet of the ballot initiative as a way for animal welfare groups to move their cause forward. In legislatures across the country, he said, bills related to wildlife or farm animal welfare often get assigned to committees typically filled with lawmakers with ties to the industries the bills are “trying to reform” — and thus go nowhere. The Massachusetts measure, versions of which died in several previous legislative sessions, is backed a coalition of groups including the Humane Society and the Massachusetts Society for the Prevention of Cruelty to Animals. It would mandate that, starting in 2022, Massachusetts farms and businesses produce and sell only eggs from cage-free hens; pork from pigs not raised in or born of a sow raised in a small crate; and veal from calves not raised in a very tight enclosure. Hens at many egg farms live in tight quarters. 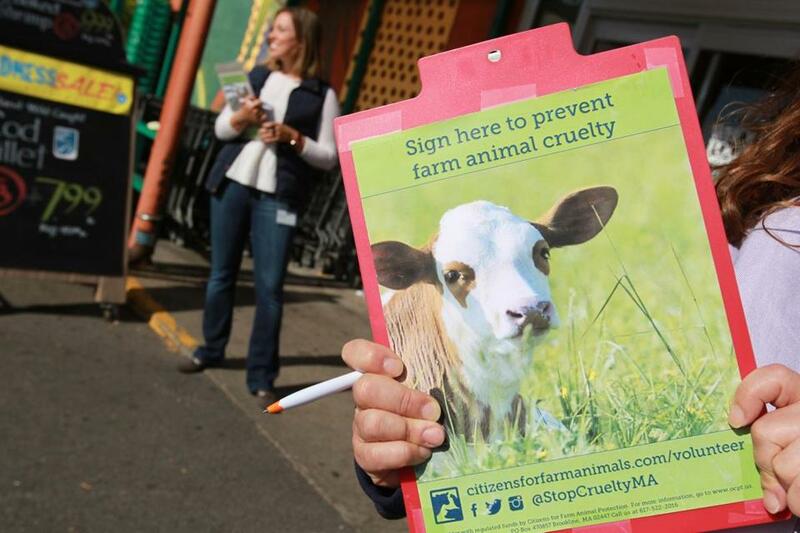 The coalition, Citizens for Farm Animal Protection, is in the midst of collecting the tens of thousands of signatures needed to get on the ballot and is expected to make the cut. Voters in other states have taken up ballot measures related to farm animals in recent years. A 2002 measure in Florida prohibited Sunshine State farmers from using gestation crates for sows, or mama pigs. A 2006 Arizona effort banned gestation crates for sows and veal crates for calves. And in 2008, the people of California outlawed those two techniques as well as small “battery cages” for laying hens. The California ballot fight was extremely expensive. Opponents of the push raised about $9 million and proponents of the new restrictions raised more than $10 million — which funded a barrage of television ads on both sides. 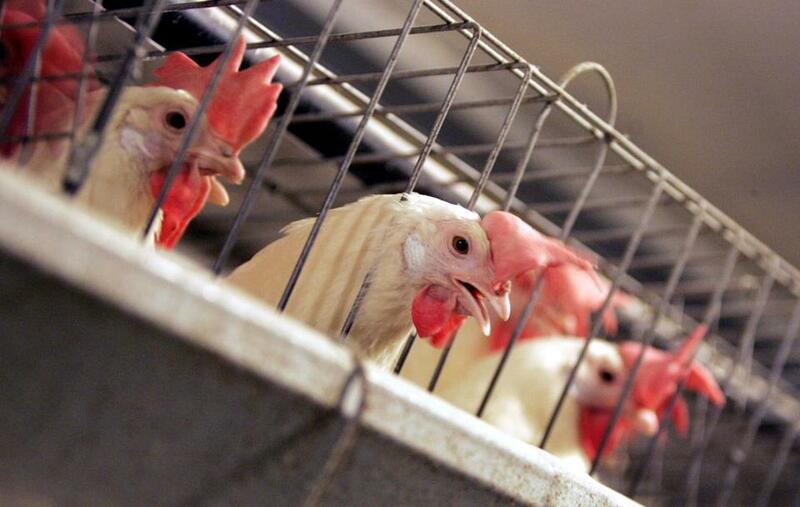 So why is the Humane Society, a nonprofit, pressing its next iteration of a farm animal protection push in Massachusetts? “It’s a very animal-friendly state,” Pacelle said. He noted that previous animal-protection ballot initiatives have been successful here and said there are a “tremendous number” of active supporters of such efforts. In 1996, Massachusetts voters passed a ballot initiative that prohibited several hunting practices and eliminated the requirement that some members of the state Fisheries and Wildlife Board represent hunting interests. In 2000, voters rejected an initiative to ban dog racing, but in 2008, the ban passed 56 percent to 44 percent. Agricultural interests say the 2016 push goes too far. They say it would narrow consumer choices and raise food prices. They say the expected increased costs would have an outsize impact on those at the bottom of the income scale. Humane Society officials dispute those forecasts and describe the effort as a modest attempt to protect farm animals from inhumane treatment — to simply allow them to stand up, lie down, turn around, and extend their limbs. Paul Shapiro, vice president of farm animal protection at the Humane Society, pointed to price-conscious retailers that are transitioning to only cage-free eggs. “McDonald’s and Burger King are both going 100 percent cage-free and they’re not raising their prices a penny,” he said. Beyond the specific arguments about the measure, groups representing agricultural interests say there is a more extreme agenda afoot. He said the Massachusetts ballot question, if made law, would raise the cost of producing meat and thus the cost of the meat for consumers. As prices go up, consumption would go down, Warner said, and could create a cycle of higher prices begetting lower demand begetting still higher prices. Asked about accusations that he and his organization have a “vegan agenda,” Pacelle said those charges are at odds with the record of Humane Society and are just a tactic on the part of the group’s adversaries to shift the debate away from the group’s focus, better animal welfare. Pressed on whether, in his heart, he desires that a broader swath of the United States have a vegan diet, Pacelle said he does not. 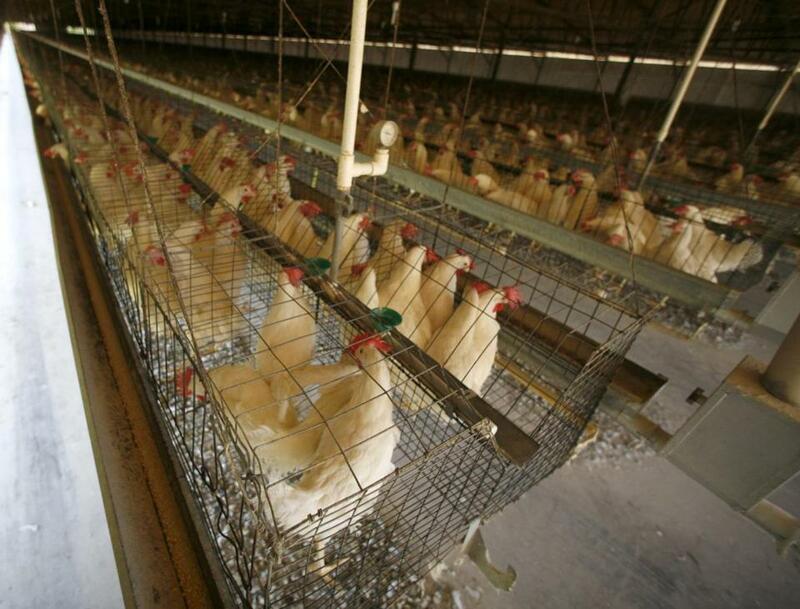 Chickens huddled in cages in California. Massachusetts voters could restrict sales resulting from such practices. Joshua Miller can be reached at joshua.miller@globe.com. Follow him on Twitter @jm_bos. Click here to subscribe to his weekday e-mail update on politics.